Maurice Brazil Prendergast was born in Saint John’s, Newfoundland. With the failure of his father’s subarctic trading post, the family moved to Boston in 1868. Maurice left school after only eight or nine years and was apprenticed to a commercial artist and at the outset was conditioned to the brightly colored, flat patterning effects that characterized his mature work. A shy individual, Maurice remained a bachelor throughout his life. He became closely attached to his brother Charles, who was a gifted artist in his own right Throughout his life he was accompanied and supported by Charles. According to Charles, Maurice Prendergast always wanted to be an artist and spent every available moment sketching. In 1892, Maurice traveled to Paris, where he spent three years studying, first under Gustave Courtois at the Atelier Colorossi, he eventually moved on to the Académie Julian. There he met the Canadian painter James Wilson Morris, under whose influence he began executing pochades, small sketches on wood panels, depicting elegantly dressed women and playful children at the seaside resorts of Dieppe and Saint-Malo. Back in Paris, he developed a sophisticated modern style inspired in large part by the postimpressionists, particularly Pierre Bonnard and Edouard Vuillard. In 1895, home from abroad, Maurice Prendergast joined his brother in Winchester, Massachusetts. Working in watercolor, oil, and monotype, he continued to focus on men, women, and children at leisure, strolling in parks, on the beach, or traveling the city streets. In 1898 he went to Venice and returned a year later with a series of watercolors of the city. In 1900 the Macbeth Galleries in New York mounted an exhibition of his work. In 1907 he returned to France, where he was profoundly influenced by Cézanne and the fauves. Integrating these new influences into his work, Maurice Prendergast painted more forceful works of art, with startling bright colors and staccato brushstrokes. 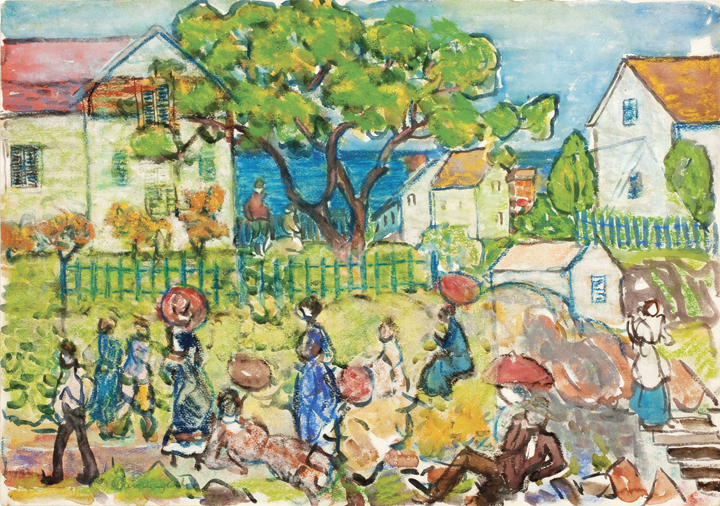 As one of The Eight, Prendergast was sharply criticized for his more abstract and brightly colored style. Following another trip to Venice, in 1911-1912, Prendergast returned to New York to select works for and participate in the Armory Show of 1913. A year later, he and Charles moved to New York. In 1915, he was given an exhibition at the Carroll Galleries. Although the critical reception of his work remained mixed, he was able to attract a number of important patrons, among them John Quinn, Lillie B. Bliss, and Dr. Albert Barnes. During the final years of his career, Maurice Prendergast spent his summers sketching in New England and his winters painting in New York. In 1921, the Brummer Gallery in New York held a small retrospective exhibition of his work. By 1923, Prendergast was in frail health, and he died a year later at age sixty-five.